Your tribe can help you grow. Do you have a workout buddy? How about a book club? If so, you already know the benefits of growing your tribe to help you achieve your goals. Every time you think about staying home and watching reruns instead of going for that bike ride or picking up Anna Karenina, you realize that your friends will be disappointed in you if you don’t show up as promised. 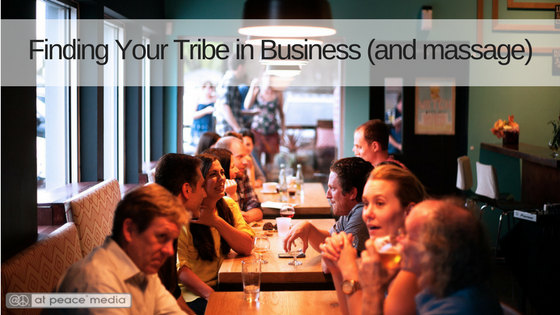 How can you use the power of your tribe to keep you on track to meet your own goals? ● Offer to help others with their goals. It can feel a little selfish to reach out to others and ask them to help you achieve your goals, but there’s nothing better than the feeling of genuine mutual support. You and your friend may even have goals that seem unrelated, but that can actually be a benefit. If you’re stressed out about marketing while they’re wondering how to effectively manage new employees, you can each be the level-headed observer where the other one struggles to take a calm, objective view. ● Invite others to join you in your goals. Maybe you want to read more peer reviewed research, or update your blog on a regular basis, or practice daily self-care. Regardless of your goals, you’re probably not the only one. Recruit a group of like-minded individuals for a challenge that lasts a month, or a quarter, or a year. From Whole 30 to NaNoWriMo, there are entire communities made up of groups organizing around a single goal. Create a Facebook group and start inviting people. You might be surprised by how many people turn out! ● Learn from those who are different from you. It’s easy to get sucked into the habit of always leaning on the experts in your own little niche, but sometimes it’s helpful to get a fresh perspective. That real estate agent who participates in your nearest BNI really knows a thing or five about creating a welcoming environment, and the college professor who participates in Toastmasters has a knack for explaining complicated concepts in easy-to-digest terms. The coordinator of that weekly park beautification MeetUp group sends amazing emails to hundreds of volunteers each month. Keep an open mind, and you may find that your tribe is much larger than you ever imagined. ● Remember: it’s okay to be in business. And it’s okay to just be friends. When we start to think about “networking,” it may start to feel like all our relationships develop a sheen of artificiality. Remind yourself that being friendly (or neighborly, or loving) is in itself a good thing. Improving your business is also a good thing. So just as there’s no reason to beat yourself up for failing to speak about your business goals at the block party, there’s also no shame in bringing them up over hot dogs and lemonade when it feels appropriate. Sharing the fact that you have a multifaceted life isn’t calculating, it’s human. Finding your tribe isn’t a magical process, it’s largely about opening yourself up to others and seeing who decides to join you. Not everyone will want to be a part of your efforts, and of those, not all will be a great fit for you and your goals. But it’s those few who are who will make the effort so incredibly worthwhile.